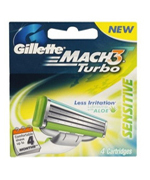 Buy Gillette Mach3 Turbo Sensitive Cartridges. Different levels of shaving pressure and skin variations. Gillette Mach3 Turbo Sensitive Cartridges Each blade is individually spring-mounted to automatically adjust and respond to the curves of the face, and to different levels of shaving pressure and skin variations. The advanced triple-blade technology, combined with an enhanced green Lubrastrip (Turbo) with Aloe Vera provides more lubrication to help the blades glide easily over the skin with less irritation. Each blade is individually spring-mounted to automatically adjust and respond to the curves of the face, and to different levels of shaving pressure and skin variations. In front of the first blade on each cartridge is a row of soft, flexible mircofins that help stretch the skin, positioning the hair so that the three blades can shave progressively closer with incredible comfort.